Friends and readers who have been following my articles long enough will know that I’m almost the opposite of Miss Rusty, our Artist who loves to try different forms of makeup on her face. Me, on the other hand, prefers a clean face as my skin is too sensitive and breaks out easily. Thank goodness to my aesthetic and facial sponsors, my condition had more or less stablize. When Sephora approached me to work on a Makeup haul article, I was overjoy yet in a total dilemma! Why so? I’m a decidophobia, and checking out Sephora Makeup collection of more than 200 items got me totally freaking out. Plus, I hardly do online shopping, so it was a tough task for me. 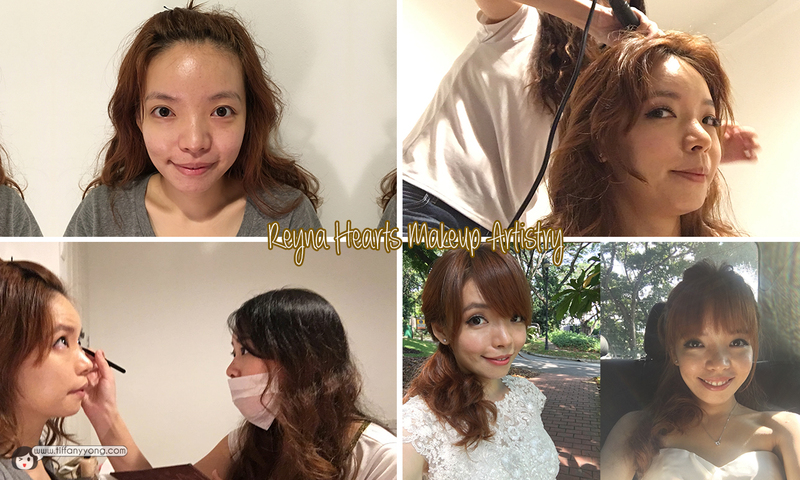 In the end, I approached Reyna from Reyna Hearts Makeup Artistry who had previously collaborated with me on the Descendants of The Sun Bridal Shoot to help me out! She had worked on my skin long enough to know what makeup products I could try. With a budget of $130 to spend, we tried to see if we can buy a full make-up set for every day use and this was what we got! These totalled an amount of S$129 and I even got a free travel size IT Cosmetics Your Skin But Better CC+ cream to try on! Problem: I realised that my foundation separates from my (oily) skin after a few hours, making my pores really visible and filled with the foundation. The coverage wasn’t very high either. Hence, I decided to try this new product from Sephora: Kat Von D Lock-It Foundation, which claims to be a long-wear liquid foundation. As you can see, this creamy foundation was able to provide a matte finish, even out discoloration (80%) in just one application and hide my blemishes. This foundation has a total of 30 shades has a new cool look with an antique wax seal (think Harry Potter!). Most importantly, it DOES NOT contain Parabens, Sulfates, Phthalates and is completely free of animal-derived ingredients. P.S. As this product is free of synthetic fragrance, it has a slightly odd (but bearable) smell which might take some getting use to. The NYX Highlight and Contour Palette happens to be a product Reyna had been wanted to try. Not only can this be used for face contouring, the shades are great for everyday eye-shadow too! Check out her article here for a more detailed review about the Palette. Problem: Not longlasting. I’ve been using this eyeliner for years, and I totally love its stiff brush which allows any beginner to draw their brush easily. However, it flakes upon drying and after a few hours, the eye-liner near the corner of my eyes will disappear. The application was “dryer” than I thought it would be. Available in 6 colours, the rubber cushion provides a powdery matte finish and one can achieve a “bitten lips” effect, or full lips with high coverage. Contains shea butter and oils derived from cotton seed, so the Cushion Lips can wonderfully nourishes and smoothes our lips. Are there any other products from Sephora you’ve tried and liked? Share with me by commenting below! Also check out and shop your favourite make up here at Sephora!